This cold weather just won't give up and the weatherman has just promised more snow. These Arctic conditions have really dried my skin out. I need some winter skincare saviours! Up until a year ago, I stayed clear of any serums in the fear that they would make my already oily skin worse. Estee Lauder's Advanced Night Repair (ANR) opened the door to serums and now I love trying new ones out. 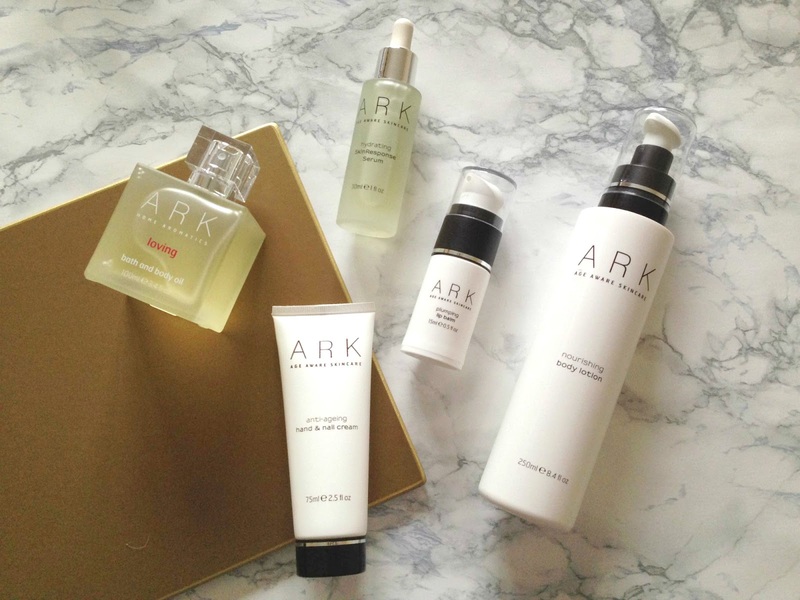 Ark's Hydrating Serum is very close to ANR in consistency and scent, they even both have the pipette dropper for application. I just dispense a few drops from the pipette into my clean hands and massage into the face. I wouldn't recommend using this in the day, it definitely should be part of your night time routine. I sleep with this on after cleansing and I wake up with hydrated, plump skin. This took me by surprise, I really didn't expect it to come in a tube with a pump. It's like a lotion in it's consistency, again think this product should really be reserved for a night time pamper. It's a strange feeling at first but it does leave your lips super soft with it's creamy finish. With nurturing ingredients such as shea butter, coconut oil and silk proteins, it's very luxurious on the skin, definitely worth the money - especially as it's in such a big container, it will last an age. My hands are the part of my body that first suffers from the cold. Chapped, dry and rough skin on your hands is so uncomfortable, a pump of Ark's Hand and Nail Cream will revive them. It's not overly heavy so you can keep it at your desk and still get things done without feeling sticky. Again, the packaging took me by surprise, it's an oil with a spray top, which makes it ideal for quick application. The calming ingredients, Ylang Ylang and Jasmine, have really helped me chill out before bed. You can even use a few drops in the bath to create a soothing atmosphere, it also has excellent moisturising benefits. 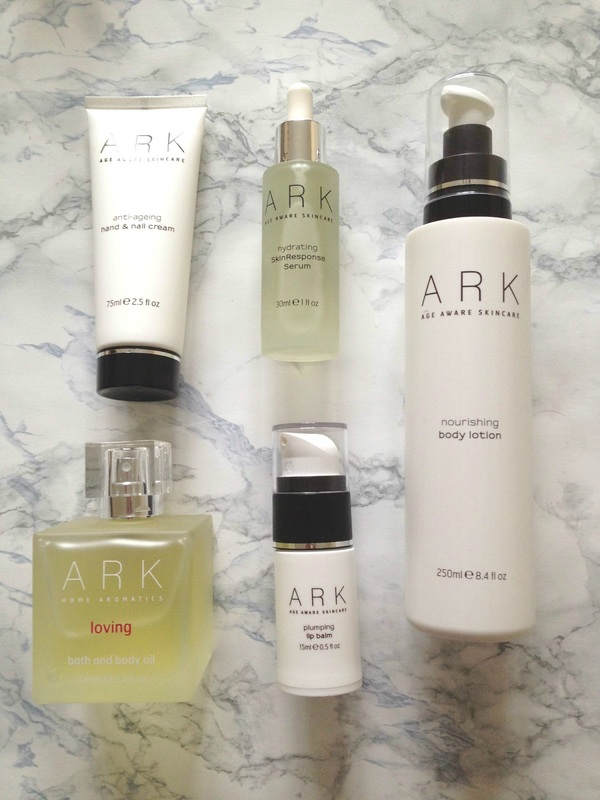 I thoroughly recommend investing in winter skincare and Ark have some great choices! Charlotte Tilbury knew the way to a bloggers heart with her make-up collection, which launched last year, rose gold packaging and a 'suits all' range of colours, how could we resist! 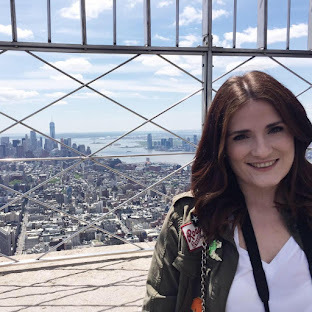 I was lucky enough to win a Charlotte Tilbury lipstick in a blog giveaway, the shade choice was mine. I went for the infamous Glastonberry dark berry shade, I'd seen Lily Melrose and a few other bloggers rave about this and I couldn't wait to get my mitts on it. First of all lets talk about the packaging, the rose gold tube looks like a vintage lipstick holder, I adore it! It's one of those lipsticks you wouldn't mind pulling out on the train to apply another coat, you'd receive envious looks from other women. It's truly stunning in it's design. The shade is a wonderful deep berry, which is perfect for winter. As you can see I just teamed it with glowy skin and an inner-corner eye highlight to let the lipstick do the talking. It's quite mosturising and has a bit of movement for a matte lipstick. Some high street alternatives make your lips feel chalky and dry but this had a softer application and feel. As for longevity, this lipstick says on all day! I did do the food and drink test and only a small section in the centre of my lips needed a second application, but I expect this with any lipstick. Well worth the price tag, I can't wait to try more Charlotte Tilbury lipsticks! What shades would you recommend? I've had two recent engagements within my family and friends, which only means one thing, I can go on the hunt for a wedding outfit soon, I'm thinking Coast or Whistles for a classic yet chic dress. Any girl knows that when you buy a new dress, you need some new accessories to match. I'm a lover of fine jewellery and there is something so satisfying about wearing a designer piece to a special occasion, so I'll be ditching the high street jewellery and hiring a piece from the Folly Boutique. The lovely owner Sophie, asked if I'd like to try out the Folly Boutique's hire service to see what I thought. I was browsing her website and honestly I was spoilt for choice. I've always been a magpie when it comes to jewellery, I love both the extravagant statement pieces but I also adore the simple yet striking daintier pieces. The Folly Boutique stocks a number of well-known jewellery designers including Mawi, Loren Hope, LeiVanKash and Orly Genger, who has an exclusive range for the online boutique. I picked out the Mawi Triple Crystal Firefly Necklace and the LeiVanKash Skull Necklace; a statement piece versus a daintier necklace. The service is ideal for special occasions like the weddings I'll be attending, you could also hire them for race days, birthday celebrations or cocktail parties. Once you find a piece you like, (you'll like everything, I promise, it was so hard for me to pick a rental), you can see on the calendar if the piece is free for rental on the required days, then you can go ahead and book it! The brilliant part of the service is that you don't have to set up your own tracked delivery, Sophie includes a pre-paid postage bag, so when you are done you can just pop it back in the post, it makes the whole service so easy. As you can see, the pieces come beautifully packaged. I cannot explain how stunning these pieces are, I was blown away by the quality and designs. The first of the two, the LeiVanKash Skull Necklace is a dainty but edgy piece, it would look amazing with a white blouse, just tucked under the sides of collar. It also has a set of earrings and a bracelet to match if you like being co-ordinated. The second piece from Mawi, the Triple Crystal Firefly Necklace, has to be one of the most beautiful things I've ever seen. It's a heavy rose gold chain with three statement spiked motifs, the pinkish tear drop shaped stones have a flecked/duo-chrome finish that changes colour in the light. The pretty stones, juxtaposed with the punkish spikes, really makes this a unique piece. There is also a ring and earrings which you can hire to form a set. *Excuse the selfies, I need a tripod ASAP! Once I was finished with the pieces it was easy to return, I just carefully packaged the items back up and popped them in the pre-paid envelope. I dropped them off to the local post office and made sure to ask for a receipt, this had a tracking code, which gave me peace of mind that they would be returned safely. I honestly can't recommend the Folly Boutique and their hire service enough, it was so easy to set up the hire and make a return. I'll be hiring again once the dates are set for the weddings and also when I get tickets for a race day in Chester. To give you an idea of prices for the hires, the Mawi necklace is £54 for a 3 day hire and the LeiVanKash costs £18 for 3 days hire. You can also choose a 6 day hire if you need the pieces for a little longer. I fell in love with the pieces when they arrived, I'm sure you will too, if you can't bare to live without them after you try them on, you can also buy the pieces, don't forget. *Folly Boutique provided the hire service for free so I could review the process. As always, the opinions in this post are 100% my own. 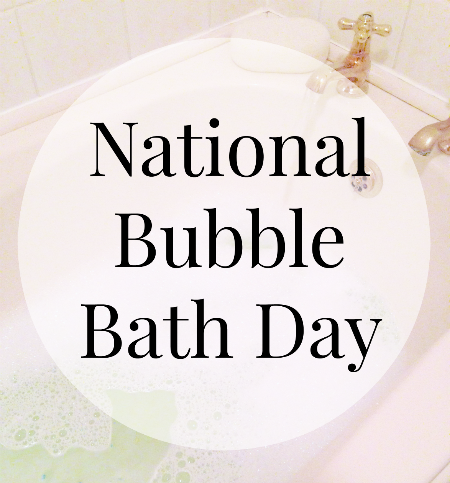 Thursday 8th January is National Bubble Bath Day! There is nothing I enjoy more than a long soak in the tub. I've found it to be so relaxing and it aids my sleeping pattern, so you should take the time to unwind this evening. For me it's about the added extras that really help you create a relaxing atmosphere, good bath products, candles, good quality towels and a cosy bath robe. I like to use bath products which are therapeutic, lavender scented bath oils are amazing and if you are are aching you should try Epsom salts to relax your muscles. I do enjoy a bath bomb as well, Lush has got you covered in this area. My favourite bath bombs have to be the Butterballs, it's one of the most plain looking, but the cocoa butter works wonders on my dry skin. I've heard great things about the Comforter Bubble Bar so I'll be picking that one up next time I'm in the Chester Lush. A Yankee candle has to be lit every time I want to take a long bath, my current favourite is Soft Blanket, it's a comforting vanilla, powdery scent. Mobile phones created a false light source that makes your body think you are still active and in good light. So ditch the technology, dim the lights and use candles for a good nights sleep. I also stick my towel and dressing gown on the radiator to warm while I'm soaking in the tub. I choose a high quality, cosy bathrobe, so the experience feels more spa like. I really want a personalised bathrobe with my initials on it, as a touch of luxury, Towel Soft do some really affordable ones - would make a nice Valentine's present actually! 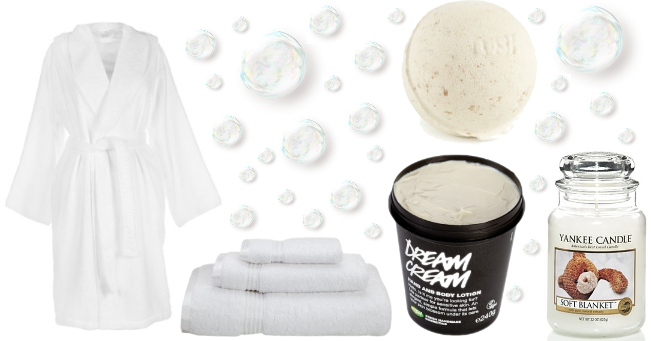 I also use body lotions after the bath to lock in the moisture, Dream Cream by Lush is one of my all time favourite moisturiser, it made it into my 14 Beauty Favourites for 2014. It's just a simple, no frills product that does what it says on the tin. After this, I'm normally totally relaxed and I can easily drift of to sleep with ease. I'm really looking forward to my bubble bath this evening. I have some bath bombs from Lush's Boxing Day Sale, I think I might try Candy Mountain. What products do you like to use for a relaxing bath? 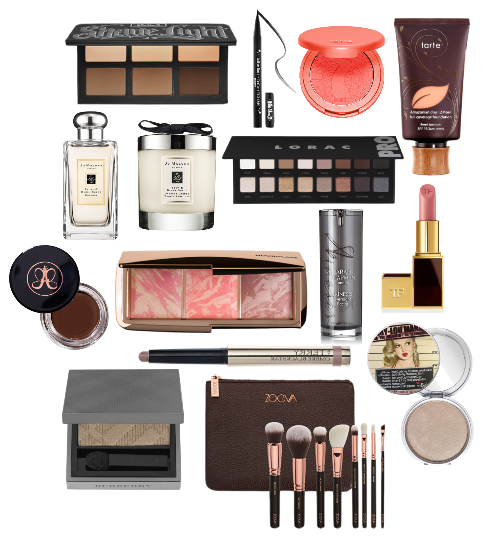 I felt rather inspired by Michelle's 'Ten Beauty Brands I Want To Try in 2015 ' on her blog, Thou Shalt Not Covet, I thought it was a nice round up, which narrowed down a shopping list for 2015. I often go a little mad when buying make-up and skincare throughout the year, leaving me with drawers pilled high. As part of my New Year's Resolutions, I've decided to use up and work my way through products. Then I'll hopefully be replacing them with something from this list of products and brands I want to try in 2015. It also gives me the chance to review new items for the blog! I've been lusting after Kat Von D products from afar, as we can't buy the products in the UK, but you can order from Sephora and ship to the UK. I've heard amazing things about the Tattoo Liner, so that will be on my 'to buy' list, as well as her newly released Shade and Light Contour Palette. Tarte seemed to explode in the blogging community after QVC started selling the American brand, I'm yet to try anything but the Amazonian Blusher and Full Coverage Foundation are calling my name. EVERYONE seemed to receive a Jo Malone fragrance or candle for Christmas this year! As I don't live near a counter, I've not been able to try the scents, but next time I go to Liverpool I'll be giving them a try. I do like the sound of the Peony and Blush Suede, as well as the Wood Sage and Sea Salt fragrances. Lorac are another hyped up American brand, they seem to be taking the 'Best Palette' award on most beauty bloggers 2014 favourites posts. I love that they have a row of mattes and a row of shimmers. I think I need to use my Urban Decay Naked Palettes up a little more before justifying this purchase. This year I fell in love with Soap and Glory's Archery Brow Pencil but in 2015, I'd love to up my brow game and add Anastasia's Dip Brow to my routine. When this blush palette was released, I knew I needed it, but unfortunately at the time I couldn't justify the price tag. I'll be saving up for this beauty. Lily Pebbles and Anna from Vivianna Does Makeup swear by this serum/oil. As another resolution I made was to look after my skin more, I'll be picking this up once my Estee Lauder Double Wear runs out. Tom Ford's Lips and Boys collection has made these extravagant lip colours more affordable, so I'll be trying out these minis, before splashing the cash on the full size colours. Amelia Liana has enabled this craving for the By Terry Ombre Blackstar sticks, I have a Topshop dupe, which I love but I'd like to own a high version too. Pale Barley was mentioned in a lot of beauty blogger's posts this year, it seems like the perfect 'one colour all over the lid' shade. They are now stocked at Boots too, so I can spend my points on them. I ummed and ahhed too long about these rose gold brushes and now they have no stock on UK websites, you have to order from the brand's European website. I'd rather this set than the new Real Techniques Bold Metals brushes, this set seems more rounded and complete. This has to be the most talked about highlighter of 2015, which is why it has to be mine. I'm just about to hit pan on my Sleek highlight so I'll be purchasing this one, once that gives up the ghost. It's amazing how much other blogs have influenced what is on my wish list for 2015, shows the power of blogging! What are you looking forward to trying this year?